Jason Adjepong Worilds was born March 3, 1988 in Rahway. Fast and strong, he starred in youth league football on both sides of the ball, and went on to play running back and defensive end for Carteret High School. Jason recorded 22 sacks as a junior and senior and was All-State both years. He also competed for the Ramblers’ track squad. He was considered the school’s best all-around athlete since baseball Hall of Famer Joe Medwick. Jason was a Top 10 recruit as a defensive lineman. He accepted a scholarship to Virginia Tech in 2006 and red-shirted two games into his freshman season after suffering a shoulder injury. Injuries continued to nag him, but by 2008 he was the Hokies’ defensive leader. As a junior in 2009 he had become a nightmare for ACC quarterbacks, with nearly 80 quarterback sacks, hits and hurries. Jason decided to skip his senior season and enter the NFL Draft. He was selected near the end of the second round by the Pittsburgh Steelers. 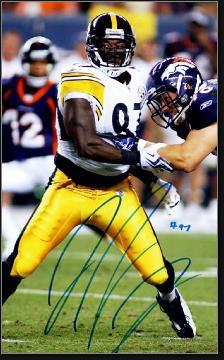 At a speedy 6’2” 260 lbs., Jason was a good fit as an outside linebacker in the Steel Curtain defense. From 2010 to 2012, he was mostly a situational player, backing up James Harrison and LaMarr Woodley. During that time, Jason recorded a total of 10 sacks. The team made it to the Super Bowl his rookie year, but fell to the Green Bay Packers. In 2013, Jason cracked the starting lineup and led the Steelers with 8 sacks. In 2014, he and Cameron Heyward—son of Ironhead Heyward—shared the club lead with 7.5 sacks. After the season, Jason was a free agent, arguably one of the top 2 or 3 linebackers on the market. He shocked the football world when he announced his retirement at age 27. Jason, a Jehovah’s Witness, explained that he wanted to devote more time to his religion, using his fame to attract more followers. Jason’s coach, Mike Tomlin, supported the decision. "It may be a decision that a lot of people can't understand, but makes total sense to him," he said. "I have a great deal of respect for that as I'm sure everyone else in our organization does. I congratulate him and champion him on having the strength to make that decision."